Holy Mackerel! With the arrival of Disney’s The Little Mermaid at Toby’s, the Dinner Theatre of Columbia, it is tempting to bombard this review with a school of fish puns. But if you think I am going to take the bait, well, you are floundering up the wrong pike. I don’t mean to carp on this but there are enough fishy lines dropped throughout the show that with any more from me and you’d be up to your gills in them, wind up with a haddock, and eventually tuna me out. 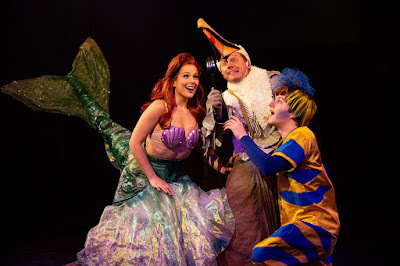 Based on one of Hans Christian Andersen’s most adored stories and the 1989 classic animated film, it was no fluke that Disney’s The Little Mermaid netted two Tony Award nominations in 2008. It features music by eight-time Academy Award winner, Alan Menken, lyrics by Howard Ashman and Glenn Slater and a book by Doug Wright. It conveys the fairytale love story of a beautiful young mermaid (Ariel) who at first is infatuated with “human things” like a fork and other items discarded at sea and falling to the ocean floor where she resides and then infatuated by a human being—a handsome prince (Eric) who is on a boat at sea. Prince Eric hears her lovely voice and he, too, becomes spellbound. What then transpires and how they ultimately hook up (oh, dear!) is the essence of the plot and is a joy to behold. 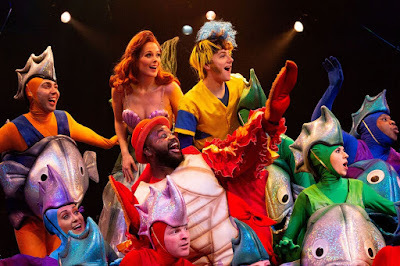 Toby’s imaginative artistic team originally wanted to fill the theater with water up to the ceiling so that all the aquatic characters in the show can move about freely in their natural habitat. But with the luscious food at the buffet (seafood and all) getting soggy, the audience drenched if not drowning, and the cast with their mic’s affixed to them getting electrocuted, the show’s run would be limited to one performance, if that. Rather, a more conventional approach was adopted and it worked magic. Costumes by A.T. Jones & Sons are magnificent and colorful beyond belief. The aquatic characters including a variety of sea life, such as a flounder, a crab, a couple of eels, other fishes, a flock of seagulls and, of course, a bevy of mermaids replete with extended tails are decked out in creative attire that are sure to please the young children (and adults) attending the show. The costumes for the sailors above the surface, King Triton, the villainess sea witch Ursula, and the ensemble are similarly outstanding, lavish, intricate and creative. Another triumph is David A. Hopkins’ vividly chromatic lighting design, which is clearly worthy of a Helen Hayes Award nomination. The spectacular mixing of hues with a blue-green accent to depict the underwater action is first rate. Mr. Hopkins employs four spotlights from above with each casting simulated sun rays peering down from the sky through the depths of the sea. It is a gorgeous touch. Mr. Minnick’s choreography is detailed and fluid working the in-the-round stage to near perfection. 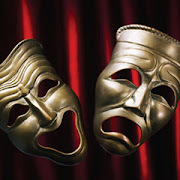 Grouper, I mean group numbers, such as “Daughters of Triton,” the clever “Positoovity,” the hilarious “Les Poissons,” “She’s in Love” and the show stopper “Under the Sea” are expertly performed. This is no small achievement given the bulky costumes worn by the cast members, and the precise execution avoids collisions. Well done! More top notch choreography is on display in “Sweet Child” and “Daddy’s Little Angel.” Here, two green-clad eels, Flotsam (Taylor Witt) and Jetsam (Joey Ellinghaus) who are loyal subordinates of the sea witch Ursula perform while on rollerblades. Using synchronized strides and shifting upper body movements, both gracefully and deliberately slither around the stage in artistic, electric performances. Alan Menken’s score is melodic and delivered exceptionally by Music Director Ross Scott Rawlings and his 6-piece orchestra—even without a bass. Her onstage chemistry with Russell Sunday as her father and Justin Calhoun as Prince Eric offers believability to this make believe tale. 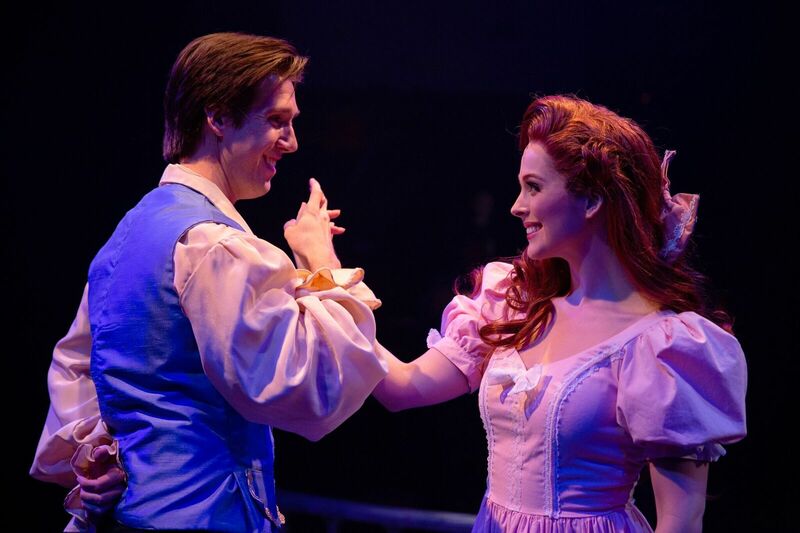 Ariel’s love interest, dashing Prince Eric is played outstandingly by Justin Calhoun. I am pleased to see Mr. Calhoun in a leading role whereby he can showcase his pitch-perfect tenor voice. His convincing swashbuckling demeanor throughout the production exhibits his fine acting skills as well. Mr. Calhoun’s romantic solo ballad “Her Voice” and his duet with Ms. Middleton in “One Step Closer” are beautifully performed. Mr. Sunday hits the mark as the widowed King Triton, the strict but caring father of his youngest daughter Ariel. Attired in a nautically-themed lavish costume including a wild, eye-catching crown, the King opposes Ariel’s ascent to the surface and her collection of human things as he views all humans as fish-eating threats to his undersea kingdom. Commanding on stage, Mr. Sunday’s muscular baritone is displayed in “If Only (Triton’s Lament)” and later he is featured in a quartet with Mr. Calhoun, Ms. Middleton and DeCarlo Raspberry as Sebastian in “If Only (Quartet”). The aforementioned evil Ursula is played mischievously by Lynn Sharp Spears (a great name for the theme of this musical). She lures Ariel into trading her beautiful voice for legs so she can rise to the surface and reel in Prince Eric. Ms. Spears effectively delivers the song “Poor Unfortunate Souls” and the reprise of that number towards the end in a dramatic, action-packed scene. The always fun David James portrays Grimsby, a loyalist to Eric. His mission is to see that Eric fulfills a promise made to his deceased father—a king—that he will marry a princess. Mr. James performs admirably in the group numbers “Beyond My Wildest Dreams” and “The Contest.” He's such a cod! Rounding out the excellent cast are Elizabeth Rayca, Maggie Dransfield, Rachel Kemp, MaryKate Brouillet, Coby Kay Callahan, Louisa Tringali, Noah Beye, Sylvern Groomes, Ariel Messeca, Brook Urquhart and AJ Whittenberger. 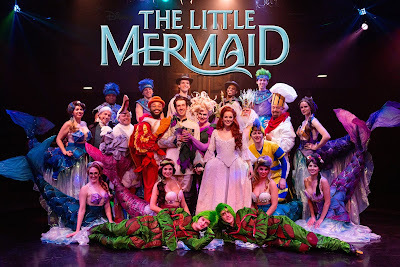 The Little Mermaid at Toby’s with its talented performers and crew under Mark Minnick’s excellent direction is a lighthearted musical for all ages where you will enjoy this production and the buffet hook, line and sinker. I said that just for the halibut. Running time. Two hours and 40 minutes with an intermission. The Little Mermaid runs through January 13 at Toby’s the Dinner Theatre of Columbia, 4900 Symphony Woods Rd., Columbia, MD 21044. Tickets may be purchased by calling the box office at 410-730-8311 or visiting online.